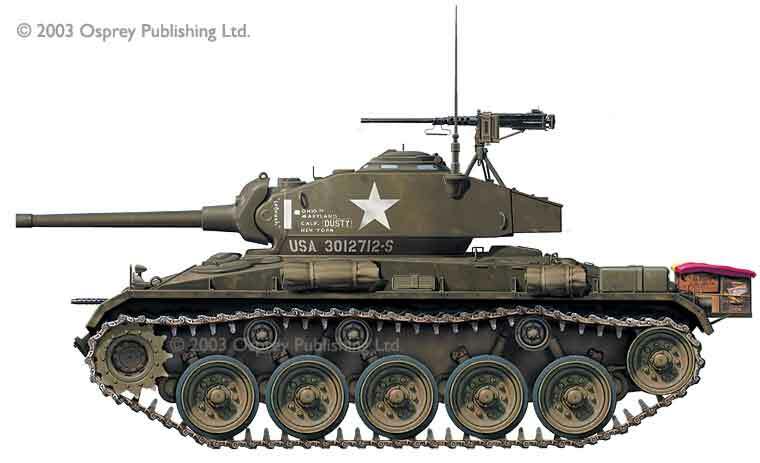 THIS IS THE M-24 CHAFEE LIGHT TANK, THE LIGHTEST TANK THE U.S. HAD AND THE ONLY TANK AVAILABLE IN THE FAR EAST. EVEN THE HEAVY TANK BATTALIONS WERE EQUIPPED WITH TANK. IT WAS NO MATCH FOR THE T-34 TANKS USED BY THE NORTH KOREANS AND EVEN THE LIGHTEST ANTI-TANK WEAPONS USED BY THEM COULD DISABLE THIS TANK. ABOVE IS THE M-1 GARAND SEMI-AUTOMATIC RIFLE. ALL OF THOSE IN THE FAR EAST AT THE BEGINNING OF THE KOREAN WAR HAD BEEN ALL THROUGH WW-II IN THE PACIFIC. IT USED AN EIGHT ROUND CLIP (ALSO SHOWN) AND WAS THE FIRST SEMI-AUTOMATIC RIFLE ISSUED AS THE STANDARD INFANTRY RIFLE. BROWNING AUTOMATIC RIFLE (BAR) WITH 20 ROUND MAGAZINE AND FOLDING BIPOD. IT HAD A SELECTIVE FIRE SWITCH SO THAT IT COULD BE FIRED IN A SEMI-AUTOMATIC MODE (1 ROUND FOR EACH TIME THE TRIGGER IS PULLED) OR FULL AUTOMATIC (ONE PULL OF THE TRIGGER, HELD IN FIRING POSITION, WILL FIRE CONTINUOUSLY UNTIL THE MAGAZINE IS EMPTY). FULL AUTOMATIC IS NOT RECOMMENDED EXCEPT IN UNUSUAL CIRCUMSTANCES AS WITH CONTINUOUS USE, THE BARREL WILL ERODE AND ACCURACY WILL BE DRAMATICALLY REDUCED. THOMPSON SUBMACHINE GUN, .45 CALIBER. IT ORIGINALLY CAME WITH A 50 ROUND DRUM BUT MOST MILITARY ISSUE THOMPSON'S USED EITHER A 20 OR 30 ROUND STICK MAGAZINE BECAUSE OF THE DIFFICULTY IN RELOADING THE DRUM MAGAZINE. THE MILITARY ISSUE THOMPSON'S WERE NOT ISSUED WITH A CUTTS COMPENSATOR, WHICH WAS USED TO PREVENT THE BARREL FROM RISING WHEN FIRED THUS TAKING IT OFF OF THE TARGET UNLESS THE USER MADE A CONSCIOUS EFFORT TO HOLD IT DOWN ON THE TARGET. A FELLOW CAVALRYMEN TOLD OF USING IT IN THE JUNGLES OF THE SOUTH PACIFIC WHEN FACING BANZAI CHARGES BY JAPANESE SOLDIERS. HE TURNED THE THOMPSON FLAT ON ITS SIDESO THAT THE MAGAZINE WAS TO THE RIGHT, HOLDING THE THOMPSON FLAT INSTEAD OF UPRIGHT. HE AIMED IT TO HIS RIGHT AND PULLED THE TRIGGER AND THE THOMPSON TRAVERSED FROM RIGHT TO LEFT, LITERALLY MOWING DOWN THE ENEMY TROOPS CHARGING HIS POSITION. 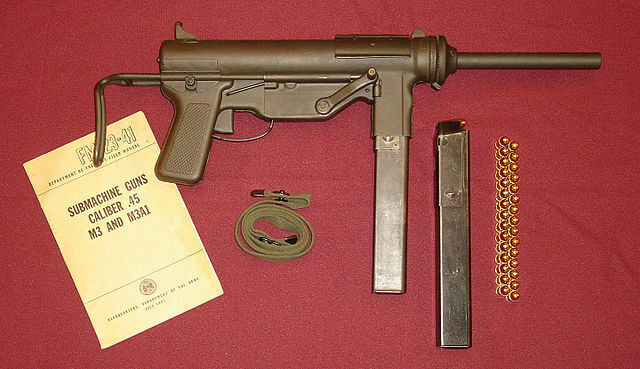 THIS SUBMACHINE GUN (CALLED THE "GREASE GUN" BECAUSE OF ITS APPEARANCE) WAS INTENDED TO REPLACE THE THOMPSON. WITH ITS COLLAPSIBLE STOCK IT TOOK MUCH LESS SPACE. IT WAS ALSO LIGHTER AND MUCH CHEAPER TO PRODUCE AND MOST IMPORTANTLY,IT WAS MORE ACCURATE AS IT TOOK NO EXTRA EFFORT TO KEEP IT ON TARGET. UNFORTUNATELY, IT WAS PRONE TO MALFUNCTIONS, WHICH WERE NEVER ALL CORRECTED. WHILE IT SAW WIDE SERVICE, IT NEVER REALLY REPLACED THE THOMPSON. THE .45 CALIBER COLT MODEL 1911 WITH VARIOUS MODIFICATIONS BECAME THE STANDARD SIDE ARM OF AMERICAN FORCES BEFORE WORLD WAR ONE. BECAUSE OF ITS STOPPING POWER, SERVICEABILITY AND ACCURACY IT REMAINED THE STANDARD SIDE ARM WELL PAST THE END OF THE KOREAN WAR. ONLY BECAUSE OF THE DESIRE TO STANDARDIZE AMMUNITION WITH NATO FORCES, WAS IT REPLACED BY THE 9MM CARTRIDGE USED FOR ALL NATO PISTOLS AND SUBMACHINE GUNS. IN PRACTICE, IT REQUIRES AT LEAST 2 9MM ROUNDS TO STOP AN ADVERSARY AS OPPOSED TO ONE .45 ROUND. 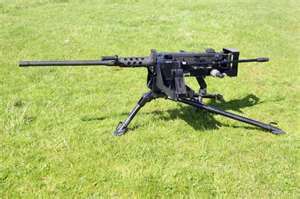 MACHINE GUN, .30 CALIBER, BIPOD MOUNTED. IT USES 250 ROUND BELTED AMMUNITION. BECAUSE OF ITS WEIGHT, IT CAN BE OPERATED BY A CREW OF TWO, ONE TO CARRY AND OPERATE THE WEAPON, AND ONE TO CARRY EXTRA AMMUNITION. 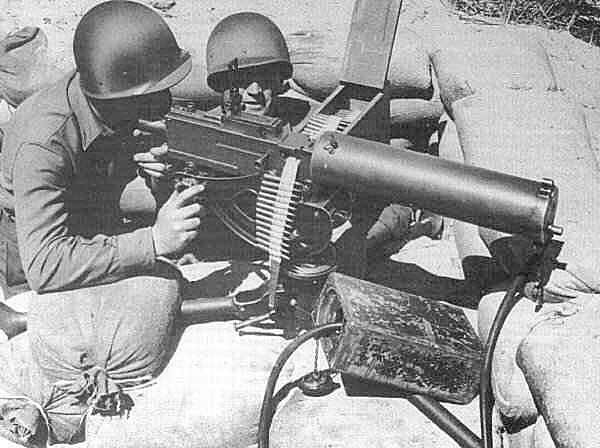 MACHINE GUN, .30 CALIBER, WATER COOLED. NOTE THE WATER CAN. BECAUSE OF ITS WEIGHT, IT REQUIRED A CREW OF FIVE. ONE TO CARRY AND OPERATE THE WEAPON, ONE FOR THE TRIPOD ASSEMBLY, ONE FOR THE WATER CAN ASSEMBLY AND USUALLY TWO MORE TO CARRY THE AMMUNITION CANS HOLDING THE BELTED AMMUNITION. JAPANESE 6.5MM ARISAKA RIFLE. THESE AND A SIMILAR RIFLE IN 7.7MM WERE SURRENDERED BY THE JAPANESE TROOPS STATIONED IN KOREA AT THE END OF THE WAR. BECAUSE OF THE LARGE QUANTITIES OF RIFLES AND AMMUNITION, THEY WERE ISSUED TO SOUTH KOREAN SOLDIERS AND CONSTABULARY AND WERE THE PRIMARY INFANTRY WEAPONS IN USE BY SOUTH KOREAN SOLDIERS AT THE BEGINNING OF THE WAR IN KOREA IN 1950. RUSSIAN MADE MOSIN-NAGANT RIFLE. IT WAS THE STANDARD RIFLE USED BY THE RUSSIAN ARMY DURING BOTH WORLD WARS ONE AND TWO. IT WAS ALSO THE STANDARD RIFLE USED BY BOTH THE NORTH KOREAN ARMY AND ALSO THE CHINESE COMMUNIST FORCES (CCF) IN KOREA. THIS WAS THE FAVORITE WEAPON OF BOTH THE NORTH KOREAN PEOPLES ARMY (NKPA) AND THE COMMUNIST CHINESE IN KOREA. IT HAD A VERY HIGH RATE OF FIRE AND THE DRUM MAGAZINE HELD 71 ROUNDS. THE MODEL USING THE STICK MAGAZINE (SHOWN JUST BELOW THE ONE WITH THE DRUM MAGAZINE) WAS MORE COMMONLY USED BECAUSE OF THE DIFFICULTY OF RELOADING THE DRUM. SOME MODELS WERE MANUFACTURED SO THAT ONLY THE STICK MAGAZINES COULD BE USED. THE STICK MAGAZINES WERE RELOADED BY USING A STRIPPER CLIP (SHOWN BELOW THE TRIGGER GUARD OF THE STICK EQUIPPED WEAPON). 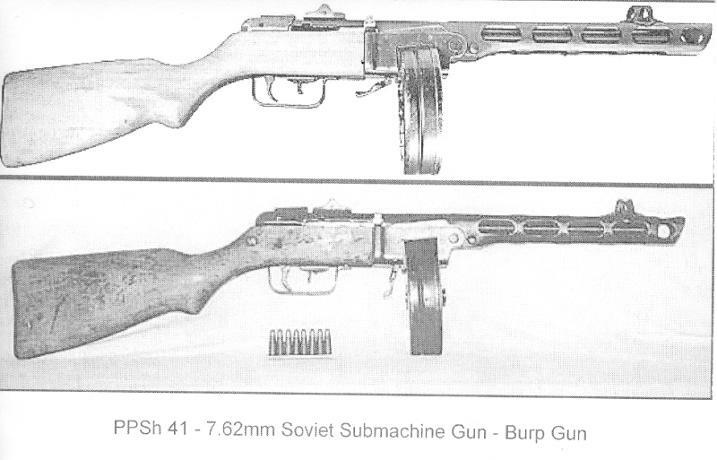 THE CHINESE TROOPS MOSTLY USED "COPY CAT" VERSIONS OF THE PPSh AND THE THOMPSON WHICH WERE MANUFACTURED IN CHINA. THE 7.62 PISTOL CARTRIDGE IS THE EQUIVALENT OF ABOUT A .30 CALIBER ROUND, SO HAD NOWHERE NEAR THE STOPPING POWER OF THE .45 CALIBER PISTOLS AND SUB-MACHINE GUNS USED BY U.S. TROOPS. TRIPOD MOUNTED .50 CALIBER MACHINE GUN. 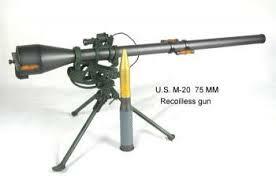 IT USES 250 ROUND BELTED AMMUNITION. IT USUALLY HAS A CREW OF FOUR, THE GUNNER, WHO CARRIES THE WEAPON, THE ASSISTANT, WHO CARRIES THE TRIPOD AND TWO MEN TO CARRY THE EXTRA AMMUNITION. 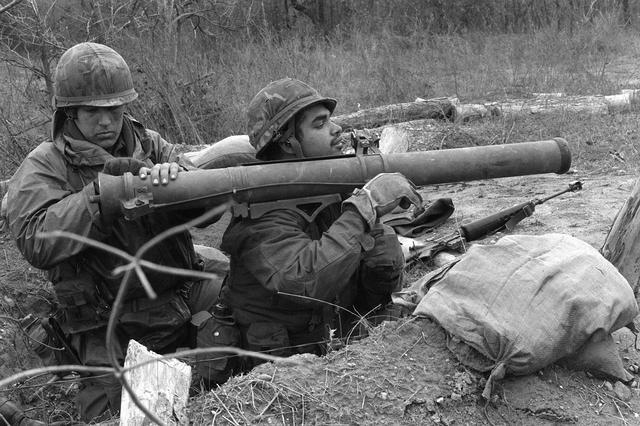 RECOILLESS RIFLE. THEY CAME IN 57MM AND 75MM. THIS ONE IS THE 57MM MODEL.THE MOST COMMONLY USED IN KOREA WAS THE 75MM VERSION, WHICH IS SHOWN BELOW. WITH HIGH EXPLOSIVE ANTI-TANK ("HEAT") ROUNDS, THEY COULD DISABLE A T-34 TANK. UNFORTUNATELY AT THE TIME THE WAR IN KOREA BEGAN, THERE WERE NO "HEAT" ROUNDS AVAILABLE IN THE ENTIRE FAR EAST AND THE HAD TO BE FLOWN OVER FROM THE U.S. ALL OF THE AMMUNITION FOR ANY WEAPONS IN THE FAR EAST WAS AT LEAST SIX YEARS OLD AND WAS SUBJECT TO A HIGH RATE OF MALFUNCTIONS. A bazooka team consisted of a gunner and an assistant/loader. 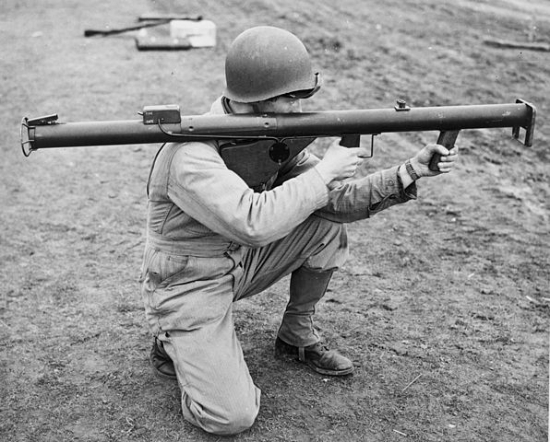 While the 3.5 inch bazooka became the standard for the Army in 1948, the only bazookas in the Far East when the war started was the old WW II 2.36 inch bazooka and the ammunition for it was all left over from the war. On July 12th, instructors and 40 3.5 inch bazookas with 5 founds each arrived at the 24th Infantry Division. Operators were trained and by July 15, the operators had been trained and 200 more 3.5 bazookas had arrived and were issued to units of the 24th Division. 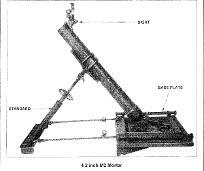 The 4.2 inch mortar used in WW II and in Korea had a total weight of 333 pounds: 175 for the base plate, 105 for the barrel and 53 pounds for the supports. It was transported, along with its ammunition, in a trailer towed by a jeep. As with all equipment and ammunition initially available in Korea, the mortar and ammunition were at least six years old. Russian made T-34 tank. It had a top speed of about 34 MPH. It was comparable to the heaviest tank that the U.S. had in use at that time. Unfortunately none of those tanks were in the Far East, they were all in the U.S. and Europe. 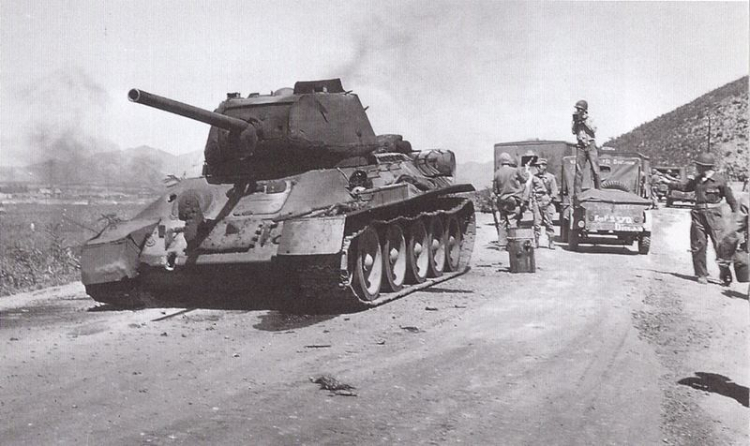 The only tanks available in the Far East were the "Chaffee" tanks shown at the beginning of this section. They were the lightest and smallest in service at that time and were also left over from WW II. Picture of a knocked out T-34 appears below. 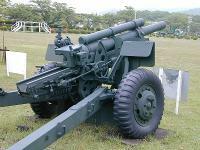 105mm howitzer. During the first encounter with the T-34 tanks at Osan, there were only eleven anti-tank rounds available. Because the the fourth shell was defective, the crew was only able to fire three rounds. 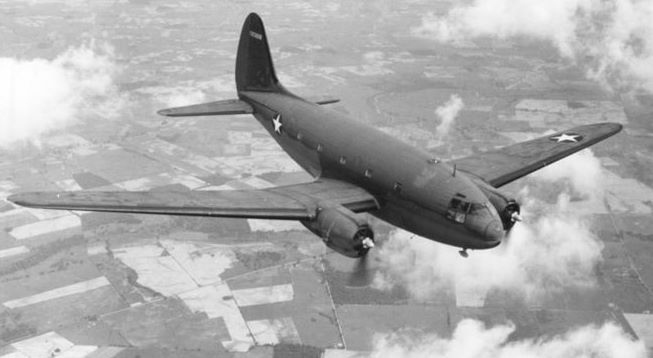 The C-54A was the first fully militarized version of the DC-4. It was capable of carrying 50 combat equipped soldiers or 32,600 pounds of cargo. 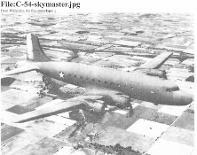 President Roosevelt's C-54 was called the "Sacred Cow", and General MacArthur's was called "Bataan". The C-54 has a maximum speed of 280 MPH and a rage of 2,500 miles. 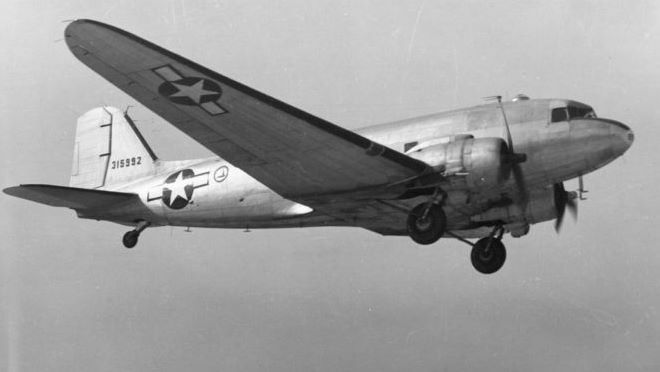 THE C-46 Curtiss Commando has more powerful engines, has a large cargo door capable of accepting a jeep and it can fly farther and at higher altitudes than its better known counterpart the C-47 (military version of theDC-3) "Gooney Bird". C-47 "Skytrain", the military version of the DC-3. Because of its small loading doors aqnd narrow fuselage, it could only carry troops and supplies. Corsair-the primary navy fighter and fighter-bomber during the Korean War. It operated primarily off aircraft carriers and they were used to support the First Provisional Maine when it went to Korea. The MIG 15, on the left was piloted by Russian pilots and the F86 Sabre Jet shown on the right fought each other for most of the Korean War. View from the front is above and view from the back is below. This helicopter was used almost exclusively to evacuate wounded during the last year of the Korean War.